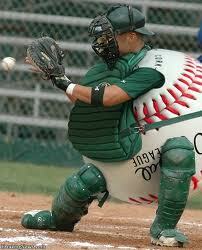 You know, you really need balls to be a catcher in major league baseball. Ever wonder how baby baseballs are born? As my father always told me "be the ball". Ivan "Pudge" Rodriguez was never the same, even after they took the stitches out. Which ball am I supposed to keep my eye on? After surgery, John Kruk still played despite the one ball he had left being swollen. Way to keep your eye on the ball, Skeeter. Congratulations. You be hangin' with dufus this week. Wanna head on down to Toronto with me and take in a Blue Jays game? They're currently in last place in the American League, east. Maybe if they changed to this guy's uniform they'd have more success. Thanks to everyone who played along this week. Be sure and join us Wednesday for another edition of Pause Ponder and Pun. It's fun to get back in the game here at Pause, Ponder and Pun! It's fun to have you back, Boom Boom!